Finally the kitchen is being rebuilt. 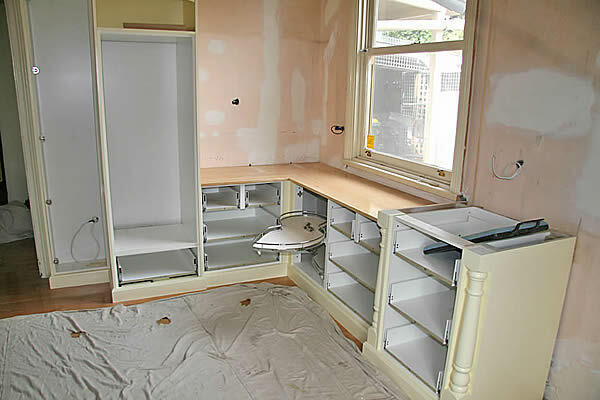 Following are some pictures of the cabinets being put in – they are a little further advanced by now, but these pictures give the general idea. Note in the third picture the blind corner shelving unit – I have 3 blind corners and all have swank means to get the goods out without me having to take a packed lunch as I delve into the depths. Everything is trying to be pushed ahead asap so the cats can come home – at the moment that is 2 weeks away as there is so much to do. I miss them horribly. Meanwhile in the garden the harvest continues. Most of the onion crop is now in – huge globes of cream golds. The shallot crop is all in – less than huge globes but hundreds of them. I picked the borlotti beans last week and they are now drying off in the greenhouse. I am eating red delicious apples off the tree. The tomatoes are now coming in strongly, and both they and the zucchini crop keep the dehydrator going 24 hours a day. The sulphur crested have left me no walnut crop. I try to resent them but they are such beautiful and happy birds I just can’t do it. I am planting winter crops now too – carrots and beetroots are seeded into their beds, young brussel sprouts are growing on strongly, and today I might get in a cauliflower crop. I am still highly restricted in what I can accomplish, but very slowly things are being done. Wow- it’s really taking shape now. I want one, too!!! I love the pull out shelves. Hey, you’re doing pretty well in the harvest stakes, well done! inspirational, and to think you’re struggling so much! Most people in your situation would have given the garden away all together. All the best! Never seen anything like those corner cupboards – very cool. It’s starting to take shape Sara & looking really nice. Wonderful news about your crops expecially red delicious off the tree – YUM. Glad to see everything coming together. Moving quicker than I thought it would. Hope it keeps going very well for you. It is all coming along, which is great. I hope the cats like it! I love those corner cupboards, too! 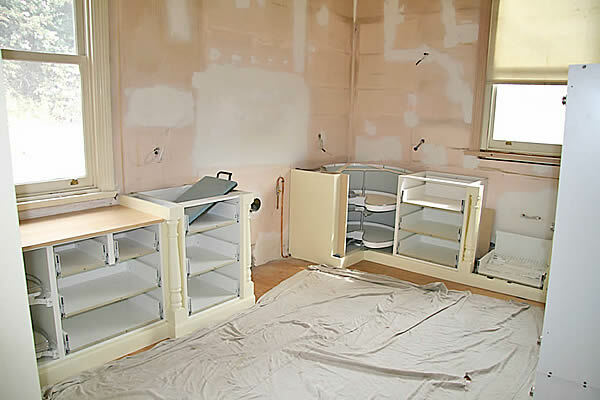 Excited to see the new kitchen when it’s finished. And goodluck on your winter crops. We’re having a harsh winter here but I’m confident my carrots will survive them. Oh you brave soul! I’ve been procrastinating a gutting and re-do of my kitchen for a year. Soon I keep saying as I love to cook.